and aggregate the results for better prediction of job performance. 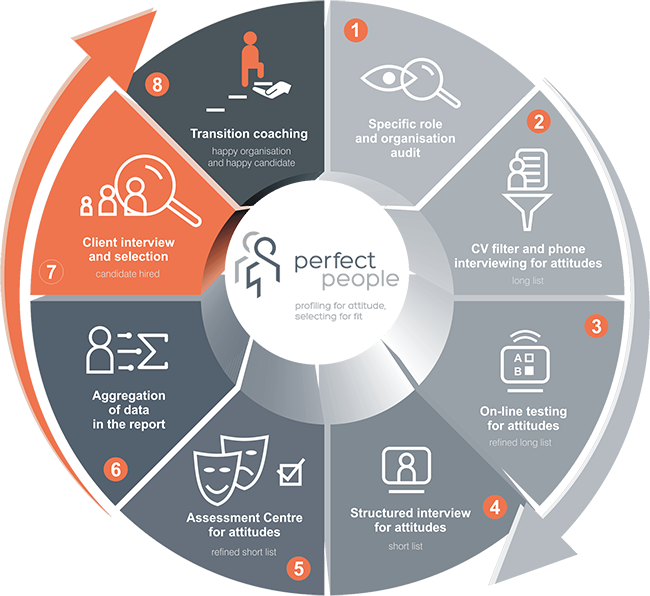 The eight stages of our selection process refer to all the phases in which individuals are assessed for roles within an organisation . These individuals may be external or internal candidates for permanent or temporary roles or may even be undergoing assessment for personal development and succession purposes. While always ensuring that the usual aspects for selection are included, (e.g. skills, experience, qualifications), our overarching focus is on auditing, personality assessment, selecting for high performance and for attitudes. Only through a clear understanding of a candidate’s underlying attitudes can we seek to ensure that, not only will the selected person have the right competences , they will have the fundamental attitudes that will help both them and your organisation thrive. All of the above will combine to provide you with a multi-dimensional perspective for the candidate. This broad perspective, with a predominant focus on attitudes, enables you to make an informed decision about hiring them or not.